Members of Highland's men's 200 yard medley relay stand behind the block in preparation for their race. As most Highland students rolled out of bed on Friday, several members of the Highland swim team rolled out of the school parking lot sporting matching white jackets. Across the backs of the swimmers were the words “State Team” written in silver thread. 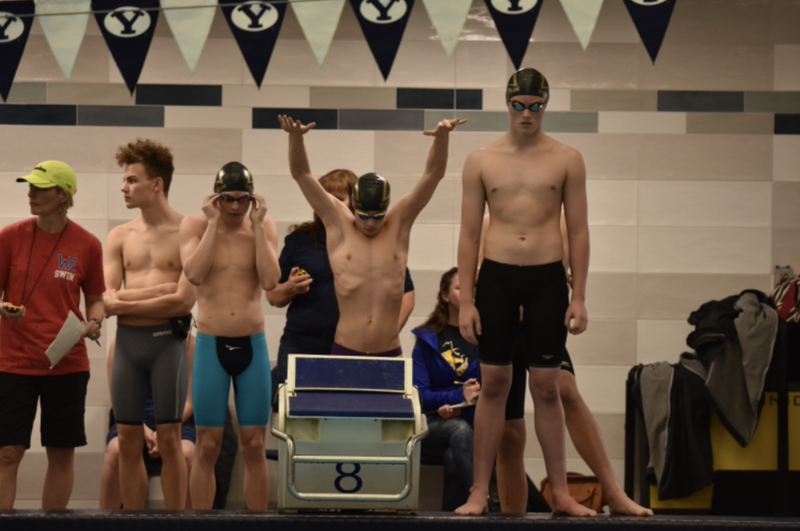 The 5A state swim meet was this Friday and Saturday at BYU, and seventeen Highland swimmers had pushed themselves hard enough to qualify for the meet. The 5A division contains many of the state’s most competitive teams, so Highland swimmers felt particularly proud to have qualified for a meet full of so many fast competitors. A new aspect of the meet was added this year, causing the state meet to more closely resemble a club swim meet. This year, all qualifying swimmers swam their individual events on Friday, and the top sixteen finishers would go on to compete in their event once again on Saturday along with the relay races. This differed from years’ past when the meet followed the normal schedule of a two-day meet with about half of the events the first day and half the second day. As competitive as this year’s state meet was, Highland had many swimmers go on to compete in finals on Saturday. Among these was Michael Wallis, a junior who competed in both the 100-yard backstroke and the 100-yard butterfly. In the end, the Highland women’s team ended up finishing in 14th place out of the 20 teams that attended, while the men’s team finished in 11th. Despite the small size of the team, the team felt that they held their own among some of the more dominant teams that were competing. The Highland swim team has proven that the environment is like that of a family, and each member of the team is appreciated. 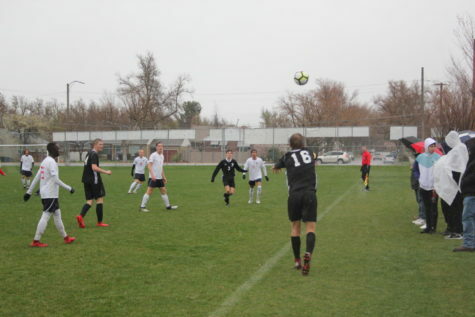 Although the captains, who emphasized the importance of a tight-knit team, will soon be graduating, the team hopes to continue to support one another like they have in years past.